Update, February 4: According to CBS News, 21 Savage wasn’t the target of the original arrest that landed him in ICE custody. His cousin, Quantavious Thomas (who goes by the rap name Young Nudy), and two other men were instead the focus of a sting that resulted in the traffic stop. Young Nudy was arrested and charged with aggravated assault and participation in criminal gang activity; CNN’s Nick Valencia reports that a background check was then run on 21 Savage, during which his alleged immigration status was discovered and he was transferred into ICE custody. 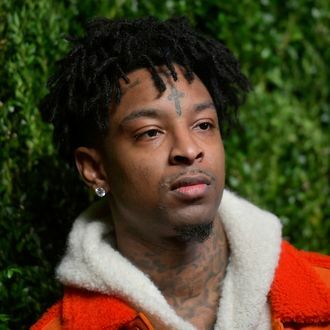 Asked how that alleged status wasn’t flagged during 21 Savage’s 2014 arrest on felony drug charges, law-enforcement officials tell Valencia that they “weren’t aware of it then and became aware of it in the fuller picture afterwards.” As Valencia notes, that doesn’t explain how 21 Savage would’ve been able to tour overseas and reenter the U.S. since 2006 with an allegedly expired visa. Update, February 4, 3 p.m.: 21 Savage’s lawyer, Charles H. Kluck, has issued a new statement accusing ICE of attempting to intimidate his client into leaving the U.S. He says that Homeland Security has known about Savage’s immigration status and history since 2017, when he applied for a still-pending new visa, but curiously did not take any legal action until Sunday. Kluck claims that the arrest is “based upon incorrect information about prior criminal charges” — referring to Savage’s 2014 federal drug conviction, which was expunged from his record last year — and that ICE is refusing to release Savage on bond. “This is a civil law violation, and the continued detention of Mr. Abraham-Joseph serves no other purpose than to unnecessarily punish him and try to intimidate him into giving up his right to fight to remain in the United States,” he says. Savage’s 2017 application was for a U visa, which is used for victims of a crime. In 2013, Savage was shot six times during an incident that also killed his best friend; his application claims that the shooting “severely affected [him] physically and mentally,” and therefore should make him eligible for permanent residence. Kluck also notes that Savage has three American-born children, making him eligible for relief from deportation.